Selecting the best technology or software solutions to help legal staff complete various tasks is never an easy decision. Boundless options are available, and there is always the dilemma of going with a vendor or trying to build something in-house. Researching these solutions for some clients, I discovered that much of their focus ended up on the selection criteria rather than the actual vendors. 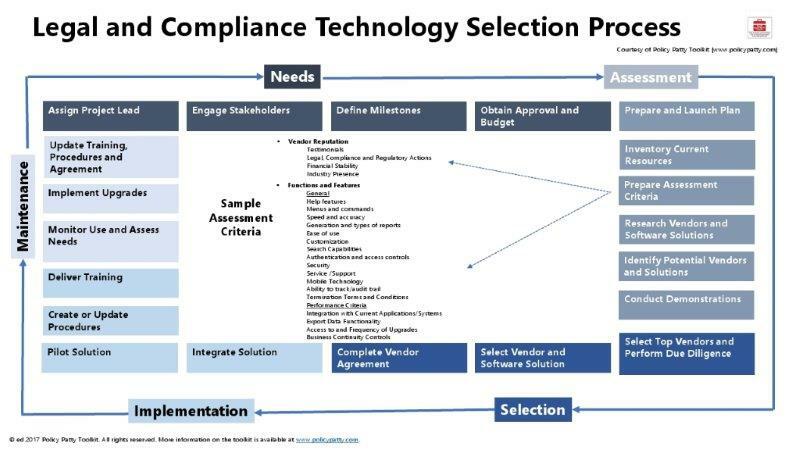 Based on my research, I prepared the attached roadmap and process overview to highlight key steps for considering, selecting, and deploying legal or compliance software (and possibly other technology with the necessary adjustments). what you need to do to acquire and maintain it. Leveraging these factors here’s an overview of key steps to consider for evaluating your next technology solution. o Assign Project Lead – assign a project lead to coordinate the initiative from beginning to end and to ensure that your evaluation process works as seamlessly as possible. o Engage Stakeholders – identify stakeholders in your organization to provide input into defining your needs and to help assess and select the software. o Define Milestones – determine what your objectives and goals are in choosing a technology solution (which process do you want to create, address, improve, or replace). o Obtain Approval and Budget – make sure you have approval and a budget to move forward since without these your evaluation process will be an exercise in futility. o Prepare and Launch Project Plan – using your milestones develop and use a project plan to map out the key measures for each milestone and the timeline for completing these. o Inventory Current Resources – identify your current resources to help define your technology needs (what you are using, why you are using it, who is using it, and how you are using it) including any issues and challenges. o Research Vendors and Software Solutions – conduct a preliminary search of potential solutions by consulting your industry contacts or checking out legal or compliance technology websites, newsletters, blogs, and any other information (see ABA Legal Technology Resource Center). o Identify Potential Vendors and Solutions – identify potential vendors based on your research and ask for product information. if you have staff, have the staff try the software. perform due diligence on the top vendors. how much the software will cost from implementation through to upgrades and maintenance. o Complete Vendor Agreement – complete the selection process via contract drafting and negotiations. If you have a defined process, follow that. deliver training to relevant staff. conduct periodic reviews of your training, procedures, and agreement (recommend an annual review) to determine if any changes are warranted and issue updates as needed. Having a defined process that is methodical, collaborative and documented, will most likely result in finding an effective solution. It will also help you avoid potential pitfalls – wasted time and resources not to mention deploying technology that doesn’t work. It may seem like too much time to spend on technology with your other priorities but know that your efforts upfront will in the long term be worth it. Patty P. Tehrani is an experienced compliance counsel and advisor and the founder of the Policy Patty Toolkit (www.policypatty.com). and controls. You can follow her on LinkedIn or contact her via patty@policypatty.com.